Do you want to enjoy your weekend in a special place? Find some enchanting places near to you. Do not waste your time and travel in a quiet holiday. You want to travel but you do not know the destination, right? Contact us and we can give you some great options for you and your family. 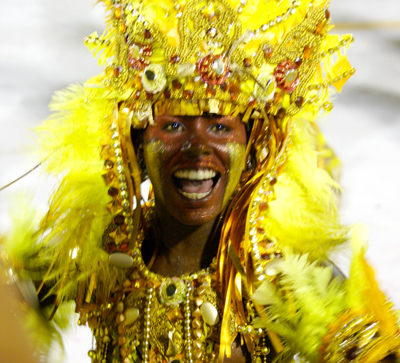 The fashion parades from each Samba School are divided into several sectors called "wings". Each fantasy belongs exclusively to one of these wards (composed normally by eighty members with the same fantasy model). In each ward members wear costumes according to the specific theme worked for the school that year. In this way, the costumes change from school to school, as well as, the wing and from year to year and each school is responsible for the creation and production of costumes, not being allowed to make any changes under the same theme by a third party. The Samba schools that offer the costumes to non-members of the party are referred to as Host Schools. These are very strict with the quality of their fantasies, so remember that no changes in the theme and the school is allowed, including banning the people from the parade. In this way, they always take all the pieces of their fantasy to the Sambadrome and do not include the any other clothing or props other than those determined by their hosts. The costumes are key pieces in the competition during the parades. So you must honor your Host School by not using the prop before the parade and keep the clothes in perfect condition. You also can never use a costume from another school. However, after the Host School's parade, you can use your costume as you wish (in costume, dances in celebration of street blocks, etc). If the school you chose parades, belonging to the special group, and have been classified in the competition, you will be able to participate again in the parade of champions, which occurs always on Saturday following the parades of the special group. To make the most of your costume, use it only in the right place at the right time. Don't forget to write down the day and time of the parade of your Host School and being in the Sambadrome at least two hours before the start of the parade (for the concentration and the final test, both required to parade). After purchasing your costume through our website send us, via email, your measurements (hips, waist, shoe size, collar, etc), preferably in CENTIMETERS. All the costumes are made by hand by local artisans who are members of the Samba schools, and hence, these have maximum caution, care and zeal during the making process. So choose your model carefully, because no later than 48 hours after your purchase, your costume is being made. © 2019 Píer Carioca Viagens, Turismo e Eventos. All rights reserved.